Both teams had to settle for a point on a cold afternoon at Galabank but it will certainly be the home side that came away more disappointed not picking up all three after dominating for large spells in the game. Annan manager Peter Murphy made one change to the starting line up that defeated Stenhousemuir, Loan signing Ross Ferguson getting his first start for the club in place of suspended Owen Moxon. It was the visitors that started the game on the front foot forcing a corner in the first minute, with the Annan defence only half clearing MacDonald got a shot away but caused no problem for Mitchell in goals. Annan attacked with Orsi coming from a wide position, Binnie saved his shot but couldn’t hold, Henderson reacted to hit the rebound but his shot was cleared in front of goal. Stirling were awarded for their early pressure in the 9th minute when Darren Smith beat the offside trap and played an inviting ball across goal for Liam Caddis who broke free from the Annan defence and slid the ball past Mitchell into the net. The goal sparked life into the Annan side, immediately forcing a corner at the other end. Aidan Smith broke free and flashed a ball across goal but there was nobody to finish. Annan were starting to pile the pressure on, wining another corner but lacking the killer touch in front of goal. Darren Smith tried to counter attack for the Binos but a brilliant sliding challenge from Swinglehurst stopped him on the edge of the box. Annan were then forced to make a change in the 33rd minute with the injured Sinnamon being replaced by Scott Hooper. The Black and Golds looked to be level when Henderson leaped to connect with Omar’s free kick but his header crashed against the crossbar. The ex Stirling striker then heads wide from Brannan’s cross. Swinglehurst had to deal with a Stirling free kick with a looping header which looked to be heading for his own goal but luckily sailed over the bar. As half time approached the home side should’ve been level, Henderson again saw his header come back off the crossbar after a good spell of pressure in front of goal. Liam Caddis tried to double the lead for the Albion shortly after the break but shot wide. Annan then enjoyed another spell of pressure but failed to test the keeper. Darren Smith then hit on the counter attack, beating the Annan defence to home in on goal, his shot beat Mitchell but also beat the post. Annan again piled the pressure on, Omar’s corner was headed towards goal by Swinglehurst, hitting the post before being cleared off the line. Darren Smith had his shot blocked by Watson, MacDonald followed up Mitchell saved. Brannon then tried to catch the Stirling keeper off guard with a long range effort but Binnie recovered to save. 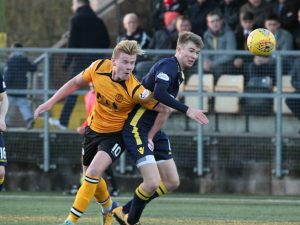 Annan were finally rewarded for all their pressure in the 87th minute when substitute Brandon Luke picked the ball up 20 yards out, cutting inside before smashing the ball past the outstretched arm of Binnie. It was a well deserved goal and a point was the least Annan deserved from the game but there wasn’t enough time left for a winner. ANNAN ATHLETIC- Alex Mitchell (GK), Jack Brannan, Steven Swinglehurst, Peter Watson, James Creaney, Dan Orsi (Brandon Luke 71), Rabin Omar, Ryan Sinnamon (Scott Hooper 33), Aidan Smith, Ross Ferguson, Blair Henderson. SUBS NOT USED- Jim Atkinson, Kevin Rutkiewicz, Ayrton Sonkur, Shaun Bell, Peter Murphy. STIRLING ALBION- Cameron Binnie (GK), Kyle Banner, Ross McGeachie, Lee Hamilton, Ewan McNeil (Ross Smith 72), Willie Robertson (Ross Kavanagh 72), Sean Dickson, Cameron Thompson, Liam Caddis, Peter MacDonald, Darren Smith. SUBS NOT USED- Connor McMullan, Mark Foden, Neil McLaughlin, Scott Davidson.